St. Martin's Press, 9781250095855, 320pp. Vincigliata Castle, a menacing medieval fortress set in the beautiful Tuscan hills, has become a very special prisoner of war camp on Benito Mussolini’s personal order. Within are some of the most senior officers of the Allied army, guarded by almost two hundred Italian soldiers and a vicious fascist commando who answers directly to “Il Duce” Mussolini himself. 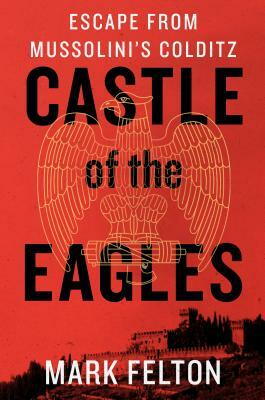 Their unbelievable escape, told by Mark Felton in Castle of the Eagles, is a little-known marvel of World War II. By March 1943, the plan is ready: this extraordinary assemblage of middle-aged POWs has crafted civilian clothes, forged identity papers, gathered rations, and even constructed dummies to place in their beds, all in preparation for the moment they step into the tunnel they have been digging for six months. How they got to this point and what happens after is a story that reads like fiction, supported by an eccentric cast of characters, but is nonetheless true to its core. Mark Felton has written over a dozen books on prisoners of war, Japanese war crimes and Nazi war criminals, and writes regularly for magazines such as Military History Monthly and World War II including China Station: The British Military in the Middle Kingdom, 1839-1997. After almost a decade teaching in Shanghai he has returned to Colechester, England where he lives with his wife and son.